Sabre-tooth cat fossil from La Brea Tar Pits; photo © Garry Hayes: Modesto Junior College Geology Dept. (all rights reserved; used by permission). 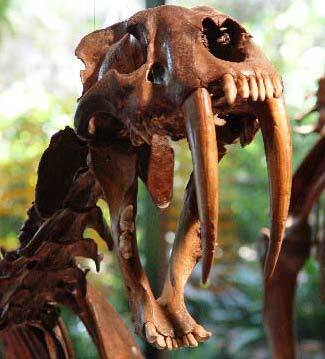 The saber-toothed cat (Smilodon californicus) was common in California 40 million years ago. Many fossil bones of the saber-tooth have been found in the tar pits of Rancho La Brea in Los Angeles. Big cats such as the saber-toothed cat and the American lion (Panthera Atrox) were once widespread throughout the Americas, becoming extinct about 10,000 years ago. Smilodon grew to about the size of a modern day lion, but was twice as heavy. 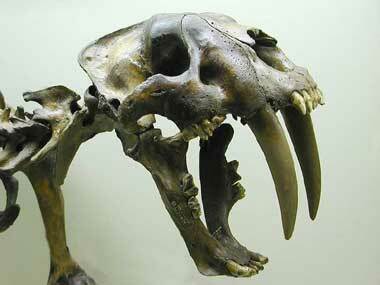 The saber-toothed cat is a member of the extinct carnivore family Nimravidae, related to both true cats and mongooses. They possibly hunted in small packs as modern lions do. Saber-tooth fossils found in the La Brea tar pits show evidence of serious crushing and fracture injuries that also show bone healing and re-growth - some paleontologists theorize that in order to survive these life-threatening injuries, they were cared for by other saber-toothed cats. Saber-toothed cats were slow in comparison to modern cheetahs and lions and were most likely ambush predators, probably preying on large ground sloths and other Pleistocene herbivores, and most likely using their large teeth to deliver a single fatal blow to the abdomen or neck (however the exact function and use of the saber teeth is debated by experts). Sabre tooth cat fossil at La Brea tar pits; photo courtesy Public Domain Photo Database.